Lionel Royer (1852–1926), Vercingetorix Throwing down His Weapons at the feet of Julius Caesar (1899), oil on canvas, dimensions not known, Musée Crozatier, Puy-en-Velay, France. Wikimedia Commons. In my second and final look at the greatest stories and paintings from Plutarch’s Lives, I consider two of his longest and best biographies, of Alexander and Julius Caesar, together with one which became a favourite with Nicolas Poussin. Although never intended to be an accurate historical account, Plutarch’s life of Alexander remains a valuable source and a good read. Much of it relates his long and difficult campaign against the Persian forces of Dareius (Darius), whose army totalled 600,000 at its peak. Their final confrontation was delayed when Alexander fell ill in Cilicia, and Alexander was warned in a letter that Philip the Arcanian intended to kill him. When Philip came in bearing him a cup of medicine, Alexander took the cup and passed Philip the letter to read. As Alexander drank his medicine, the two men stared at one another wondering who to trust. Henryk Siemiradzki (1843–1902), Alexander the Great Putting Trust in his Physician Philip (1870), oil on canvas, 245 x 346.5 cm, Belarusian National Arts Museum Нацыянальны мастацкі музей Рэспублікі Беларусь, Minsk, Belarus. Wikimedia Commons. 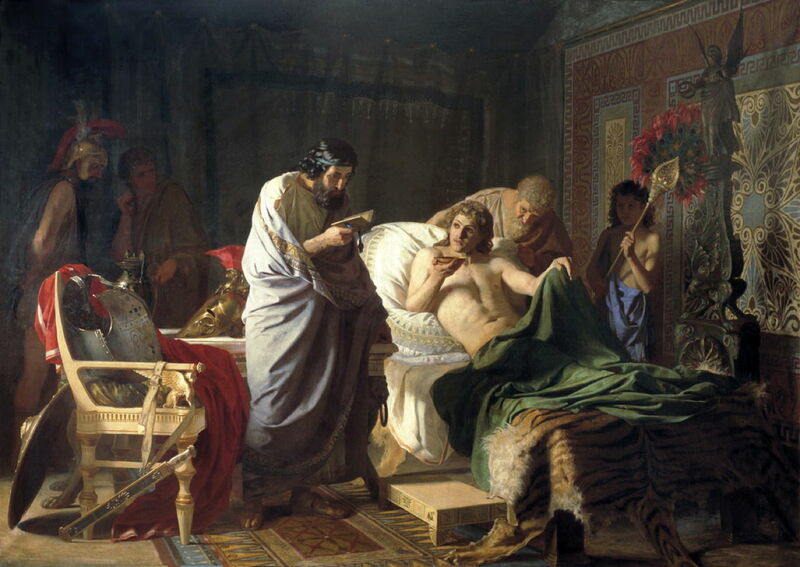 Henryk Siemiradzki’s painting of Alexander the Great Putting Trust in his Physician Philip of 1870 tells this episode wonderfully. Philip, with black hair and beard, stands reading the letter which the king had received to warn him of Philip’s intention to kill him. Alexander lies on his sickbed, the cup of medicine in his right hand, deciding whether to drink it, or to believe that warning. The old man behind Alexander leans forward, as if to reinforce the warning in the letter, and advise his monarch not to touch the medicine in the cup. Eventually, with the Persian forces destroyed, Alexander continued in pursuit of the king. This took him across desert where many of his troops had to turn back because of the shortage of water. When he approached Dareius’ camp, he was left with just sixty of his soldiers. It transpired that the once-great Persian king had been captured by Bessus, who had left him amid great riches, lying in a waggon, pierced by javelins and on the brink of death. Alexander gave him water, and when he died covered his body with his cloak. Giovanni Antonio Pellegrini (1675–1741), Alexander at the Corpse of the Dead Darius (1708), oil on canvas, 86 x 105.5 cm, Museum Kunstpalast, Düsseldorf, Germany. Wikimedia Commons. 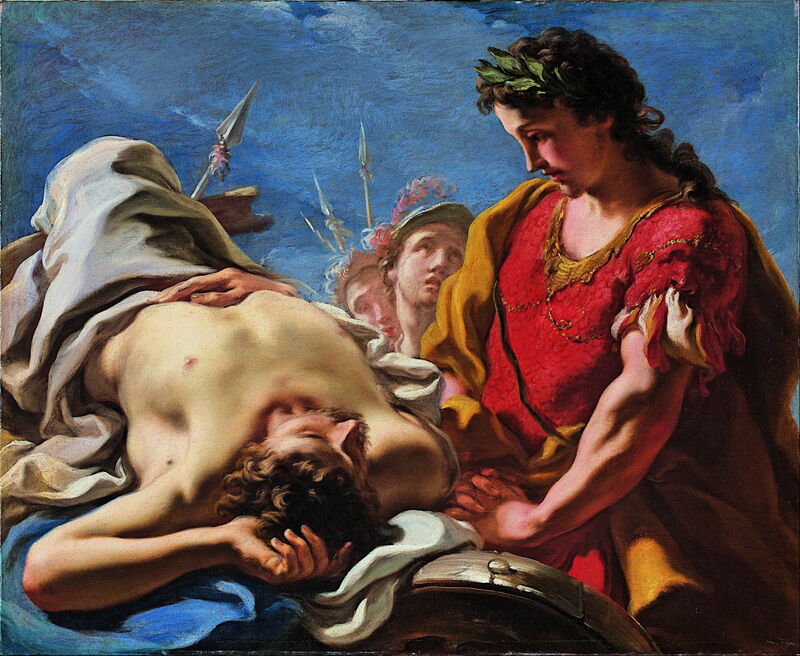 This scene is shown in Giovanni Antonio Pellegrini’s painting of Alexander at the Corpse of the Dead Darius from 1708: the conqueror looks tenderly at the conquered. The body of Dareius was then handed over to his mother, and laid in state for his funeral. Gustave Moreau (1826–1898), The Triumph of Alexander the Great (c 1873-90), oil on canvas, 155 x 155 cm, Musée National Gustave-Moreau, Paris. Wikimedia Commons. 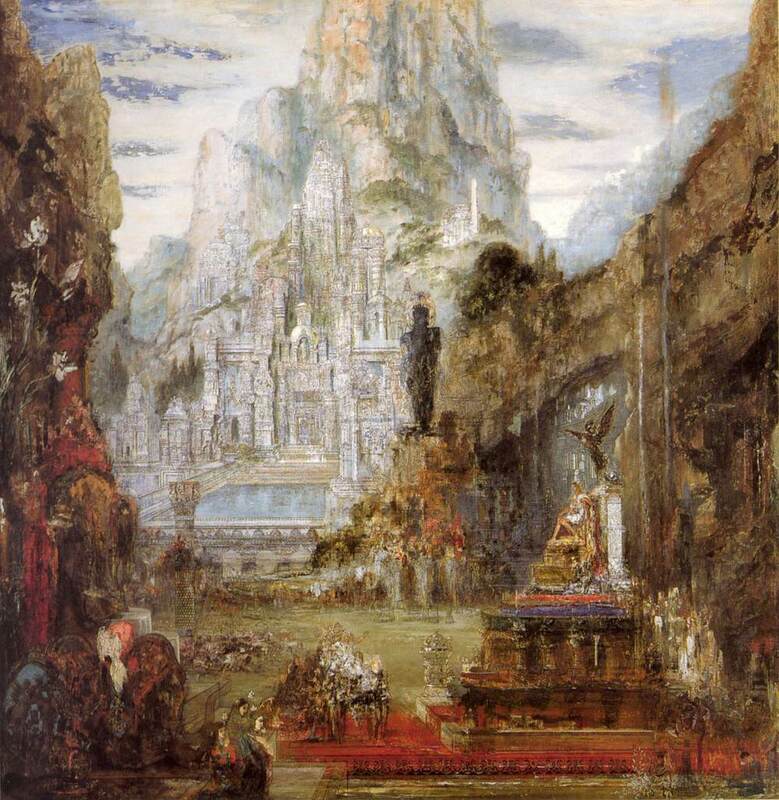 One painting which perhaps expresses Alexander’s achievements best is Gustave Moreau’s Triumph of Alexander the Great, which he painted over the period 1873-90. Alexander is shown dressed in white and sitting high on his throne in the foreground. Around him is an extraordinary imagined landscape with imposing buildings forming a gorge, and a stack of grand buildings, towers, and other monumental structures further back. These are set at the foot of a massive rock pinnacle. Moreau drew on a wide variety of sources for this most elaborate of Indian fantasy cityscapes: miniature paintings of south India, photographs by English travellers, several illustrated books, and Le Magasin Pittoresque, a contemporary illustrated magazine. Julius Caesar is Plutarch’s best demonstration of the dangers of absolute power. Although Caesar wrote his own account of his wars in Gaul, which anyone who has learned Latin will recall with faint terror, Plutarch does justice to his military accomplishments there. After Caesar had heard of the death of his daughter Julia in childbirth at Pompey’s house, and was preparing for winter, there was a major uprising in Gaul. This was led by Vergentorix, who attempted a co-ordinated rebellion against the Romans, aiming to rouse the whole of the country and exploit growing opposition to Caesar back in Rome. Caesar returned to tackle this rebellion, which culminated in the rebels congregating in the city of Alesia, where Caesar put them under siege. The Romans crushed the rebels outside the city, and forced Vergentorix to surrender. The latter donned his best armour and decorated his horse, then rode out through the gates and made a circuit around Caesar. 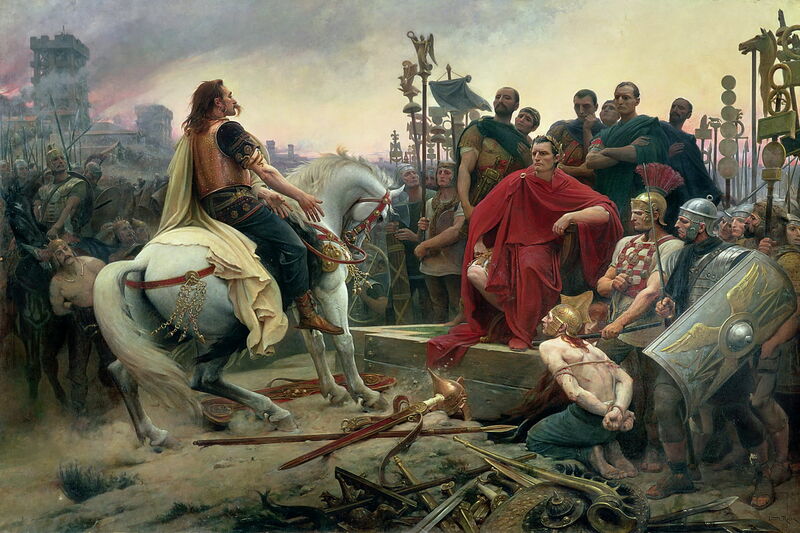 Lionel Royer’s painting of Vercingetorix Throwing down His Weapons at the feet of Julius Caesar from 1899 shows the moment of surrender. Vergentorix is about to dismount, strip off his armour, and kneel at Caesar’s feet. The plot to assassinate Julius Caesar is one of the great climaxes within the Lives. Driven by Caesar’s passion for royal powers, the plot grew from open and deadly hatred even among his former allies. Plutarch describes a series of portents, including lights in the sky and birds of omen being seen in the Forum. One seer advised Caesar to be particularly wary of the Ides of March, when he would be in great peril. Decimus Brutus, who was so close to Caesar that he was designated his second heir in his will, joined a conspiracy with Marcus Brutus and Cassius to kill Julius Caesar on the Ides of March – 15 March 44 BCE. The senate had assembled. Antony, a friend of Caesar, was held outside in a long conversation by Brutus Albinus. Caesar entered the meeting, and the senate rose in his honour. Friends of the conspirators took places around the back of Caesar’s chair, and Tullius Cimber presented Caesar with a petition on behalf of his exiled brother. Caesar pushed the petition away, and started to grow angry. Tullius then gave the sign for the start of the attack, by seizing the tyrant’s toga and pulled it down from his neck. Casca struck the first blow with his dagger in Caesar’s neck. Caesar grasped the knife and asked Casca what he was doing. Those watching who were not part of the plot dared not run away, nor go to Caesar’s aid. The conspirators then drew their daggers, hemmed Caesar in, and stabbed him repeatedly. Caesar pulled his toga over his head as he sank down against the pedestal of a statue of Pompey, which was covered by his blood. He was stabbed a total of twenty-three times. The conspirators burst out of the doors and fled, some into hiding, but Brutus and the leaders went out of the senate-house still brandishing their daggers, and marched proudly to the Capitol. Caesar was dead. Jean-Léon Gérôme (1824–1904), The Death of Caesar (1859-67), oil on canvas, 85.5 x 145.5 cm, Walters Art Museum, Baltimore, MD. By courtesy of Walters Art Museum, via Wikimedia Commons. 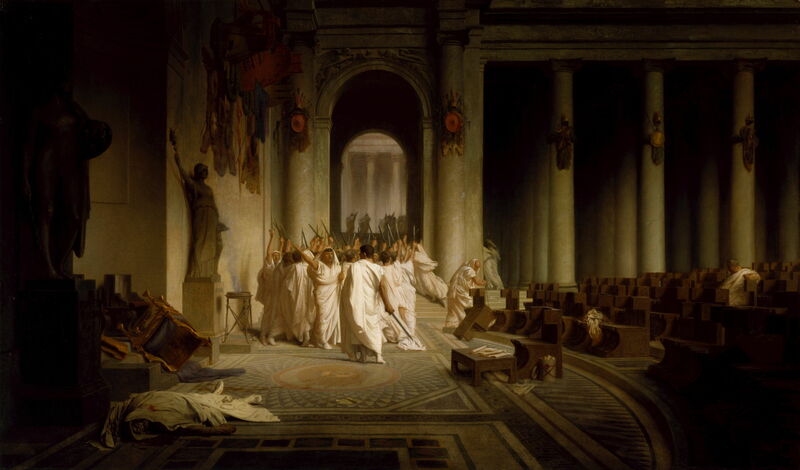 Jean-Léon Gérôme’s brilliant The Death of Caesar from 1859-67 shows Caesar’s corpse abandoned on the floor, as his assassins storm out from the Senate, brandishing their daggers above their heads. Another common theme in Plutarch’s Lives is the way in which the just and the good were so often destroyed or killed by their enemies, regardless of the intended protections of the state. For example, Phocion was denounced as a traitor, and the order given for him to be seized, tortured, and put to death. With his friends, he was taken back to Athens ostensibly to be tried, but his sentence had already been determined. He was given no opportunity to defend himself when tried in front of a rabble. He asked the crowd whether they wished to put him to death unjustly or justly. They replied “Justly”, to which he asked how they would determine that without hearing him first. He wasn’t allowed to make himself heard again, until he admitted his guilt but denied that of his friends. The crowd insisted that they too would be put to death, merely because they were his friends, and voted to put them to death. They were then given hemlock to drink by the executioner. However, there was insufficient left for Phocion, who had to arrange for a friend to pay for more poison so that he too could be executed. Phocion’s enemies even got a decree passed that his body had to be carried beyond the boundary of Athens, and that no Athenian could light a fire for his cremation. A man was hired to carry Phocion’s body beyond Eleusis, where it was cremated. Phocion’s wife was present, and built a small memorial at the spot. She then carried his remains by night to her house, where she buried them in her hearth. Nicolas Poussin (1594–1665), Landscape with the Ashes of Phocion (1648), oil on canvas, 116.8 x 178.1 cm, Walker Art Gallery, Liverpool. Wikimedia Commons. 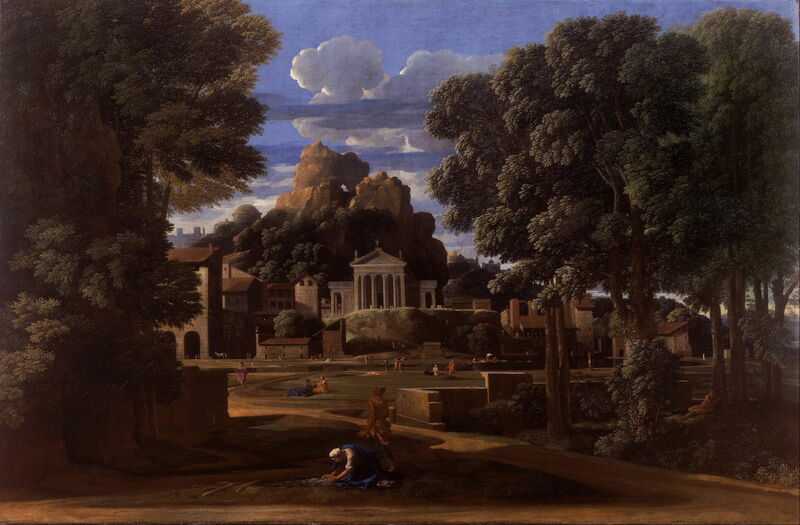 Poussin painted Landscape with the Ashes of Phocion in 1648. Phocion’s widow is here gathering his ashes to take back to her hearth, as her maidservant anxiously keeps watch. The landscape here is particularly wonderful, with the trees echoing the form of the skyline. Not long after his execution, when the people had returned to their senses, Phocion’s achievements for Athens were marked by a bronze statue, and his remains were given a public burial. Phocion’s fate reminded the Athenians of what the people had previously done to Socrates. Cato the Younger was another great Roman who came to a premature end, although in his case this was largely the result of the seizure of power by Julius Caesar, and Cato’s incisive powers as an orator. Over the years, his speeches had attacked many influential people, something which caught up with him when his previous allegiances were collapsing around him. With Caesar’s army approaching, Cato bade the citizens of Utica farewell, as if he was going to leave them. He then took a bath, after which he sat at supper with friends. He retired to his room, where he read Plato’s On the Soul. He looked up for his sword, which had been removed while he had been eating, so summoned a servant to return it. His son and friends ran in when they heard the disturbance, and found Cato covered with blood, with most of his bowels protruding, but still alive. A physician went in and tried to repair this, but Cato pushed him away and tore at his wounds until he was overcome by death. The citizens of Utica honoured him, burying his body near the sea. He was only forty-eight. This was not an easy scene to depict in a painting, and it wasn’t until 1863 that the young Jean-Paul Laurens tried a novel approach which I think proved successful. 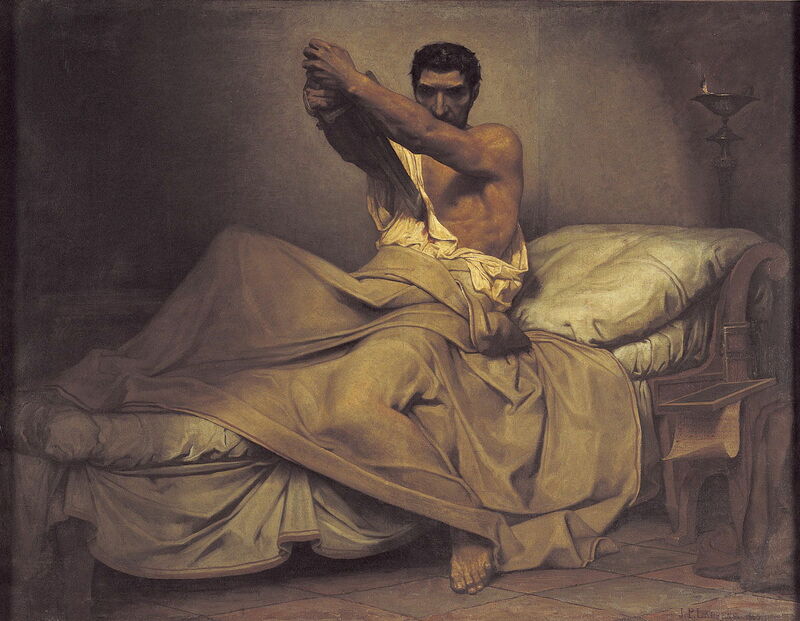 In this earlier moment of the story, Cato is trying to sink his sword into his belly, when quite alone. Plutarch’s Lives remains a collection of biographies which should be read by all, particularly those who aspire to power. It repeatedly demonstrates the corruption of power, the ease with which voters can be swayed to ostracise some of the best statesmen, and how often people have killed or destroyed those who were of greatest benefit to society. And it inspired many truly wonderful paintings. Posted in General, Life, Painting and tagged biography, Gérôme, Laurens, Moreau, narrative, painting, Pellegrini, Plutarch, Poussin, Royer, Siemiradzki. Bookmark the permalink.